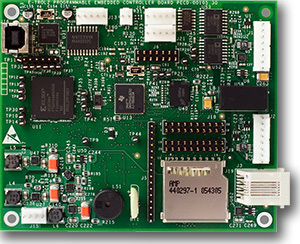 E-trolZ's DPTCA™ enabled medical device programmable embedded controller (MediPEC) is a platform to deliver standard, fully integrated control solutions for OEM devices. By integrating the hardware, I/O, drivers, RTOS, and API into a control subsystem, 5 Degrees of Integration enables OEMs to focus their efforts and resources on their core competency. The MediPEC was designed as a robust but yet flexible architecture with three models to match various application requirements. Using one of the three models, select the I/O, signal conditioning, memory, storage, communications, HMI, and information management features needed to configure your application specific solution. Program your application in E-trolZ's Device Development Environment with Microsoft’s suite of development tools. Measurement and Control expertise is accessed through the E-trolZ I/O API and Software Library of function calls that run on a dedicated coprocessor. The packaged control expertise includes I/O scanning, scaling, alarming, closed loop control and a number of advanced analytical DSP routines. Powerful applications are possible on the MediPEC with an ARM MCU, 32-bit DSP, and Control Coprocessor; large RAM, flash and storage capacities; multiple communication networks; and video displays. Yet this level of performance, integration, and configurability are very affordable through standardization, exact functionality, and the use of high volume components.